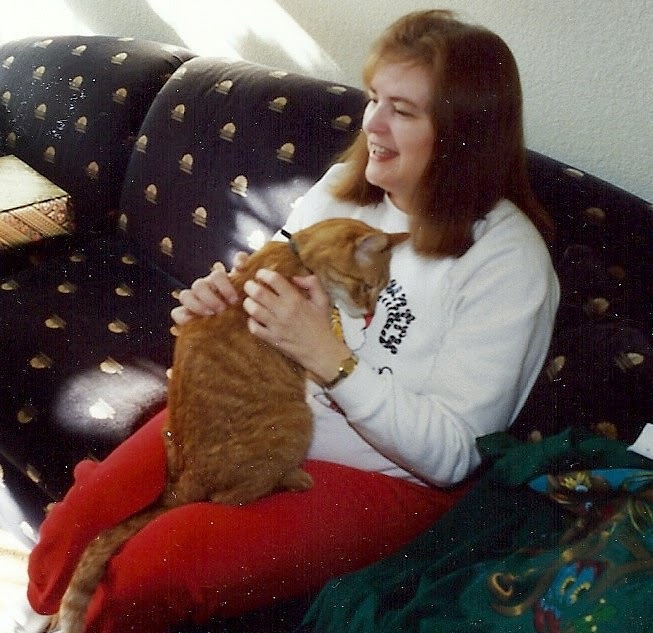 A year younger than Shadow, our black cat, this orange-striped tabby ruled our feline roost. His regal profile and haughty bearing reminded me of Rudyard Kipling’s tyrannical tiger, Shere Kahn. However, once he outgrew his rambunctious kitten stage, Tommy seldom resorted to teeth and claws to assert his authority. He ruled with a calm, don’t-you-dare-mess-with-me stare. He owned the place and everybody knew it. The rascal also owned a good size piece of my heart, and still does even from the great beyond. As with children, when you have more than one cat you should avoid showing favoritism. Otherwise, expect trouble. A jealous cat will get back at you, perhaps by snarling and biting or by tearing up furniture and carpets. Another might mope around, giving you sad-eyed looks, making you feel like a hardhearted villain. I know from experience. 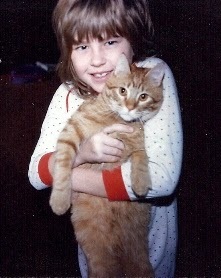 Yet, I can’t deny that Tommy was my favorite, a fact he reinforced by planting himself on my lap at every opportunity. He never cared if I was in a grumpy mood, if I was hot and sticky after working in the garden, or if I didn’t want cat hair all over my clean clothes. Pushing him away did no good; he would merely come back again and again until I relented and cuddled him a while. Stubborn, proud, loving and handsome even in old age, Tom was my kind of cat. However, there was a time when I threatened to strangle him at least a dozen times a day. Or throw him out into the tropical Missouri City, Texas, atmosphere from whence he came. It was my daughter who caused that adolescent ball of orange fur to hang around. Lonesome after our recent move from Illinois, she needed someone to play with. Telling her to leave the strange kitten alone was useless, and it seemed somewhat cruel. Later, when we ordered her inside, along with her brother who had gotten into the act, it was too late. That little tomcat knew a good thing when he saw it, or tasted it in this case, since the kids had been feeding him enticing tidbits. Long past nightfall he still lay under the towering pines in our front yard. Obviously, he intended to stay. Knowing me for the pushover I am, the kids pestered me to let the kitten in the house and, predictably, I caved in. My husband muttered about more trips to the vet, more food to buy, more cat hair, but he didn’t say no. For months afterward, I wished he had. Unable to agree on a more exalted name, we dubbed the newcomer Tommy for obvious reasons. Tommy the Terrible would have been more appropriate. From day one he tormented Shadow unmercifully, picking fights with her and chasing her from room to room until she panted like a dog. In part he was only being playful, like any young animal, but he was also establishing his territory. Even after being neutered, his domineering male instincts persisted. Poor Shadow! We humans also felt the bite of Tommy’s presence. Flea bites, that is, a new and decidedly nasty experience. Boy, do they itch! Summoning an exterminator, we had the house fumigated while both cats – Shadow being infested by then – visited the vet for flea baths. This wouldn’t be the last time. We had only begun our endless war on Texas bugs. Meanwhile, a year came and went. The kids made new friends at school, played soccer and grew. Tommy also grew into a long-legged, graceful adult, all the while driving us bonkers with his wild antics. As I look back on his first few months with us it seems to me I did nothing but scold him and squirt him with water to discourage his bad behavior. Besides bullying Shadow, he reveled in knocking over my plants, climbing the drapes, and scratching the furniture. He was a hellion through and through, but he was also cute and playful, and the kids adored him. 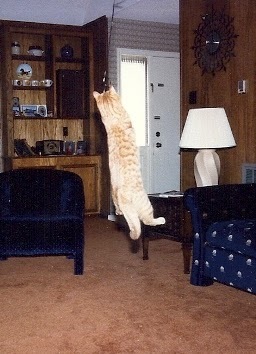 My favorite photo of Tom at that age shows him leaping straight up in the air, attempting to catch the string of a balloon. That cat had hind legs like a jackrabbit. He could easily jump from the floor to the top of our refrigerator, and could he ever run! When he got to racing around the house like a berserk miniature cheetah, you either scooted out of his way or he’d run you over, literally. Tom also showed more smarts than your average cat, such as when he wanted into a closed room. Propelling himself upward, he’d grab the doorknob with his front paws, simultaneously yowling for attention. Then he’d drop back, scraping his hind claws down the door, like fingernails on a blackboard. If we failed to respond, he would keep this up until we did. The thing that still astounds me was his focus on the doorknob. I truly believe he knew that shiny round thing opened the door. A few times, when he was trying to get into one of the kids’ rooms, I saw him hang onto the knob for a moment as if hoping to turn it. I believe Tom’s intelligence also helped the two of us make peace. One evening he pulled another crazy stunt. Scolding him had proven useless. This time I scooped him up, carried him into the master bedroom and sat him on the bed. Looking into his eyes and stroking him, I told him I loved him and wanted him to be a good boy. He stared back at me intently, ears perked, while I repeated this message over and over in a low, soothing tone. I’m not saying Tommy understood my words, but I think he did respond to my tone. He seemed to calm down somewhat after that night and our relationship improved. Perhaps I simply accepted him as he was. One thing I’m certain of: cats know when they are loved and they are capable of great love and loyalty in return. Lyn Horner resides in Fort Worth -- "Where the West Begins" -- with her husband and several beloved cats. This former fashion illustrator and art instructor loves reading, writing and gardening. 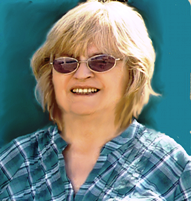 She is the author of the award-winning Texas Devlins trilogy, starring three siblings who bring a glimmer of psychic magic to the Old West. Tears did fill my eyes, I must admit, since I have had lots of beautiful, intelligent, loving cat "children" and I miss each and every one of them. Gonna go cuddle our last one, Monkey, and be very thankful for her! Lovely story, Lyn. Cats have never liked me, but I do have a doggie that I adore, and if he goes before me, I'll be devastated. I posted the origin of the "Rainbow Bridge" on FB last night, and it certainly brings peace of one's heart. I imagine you and Tom crossing over that bridge together one day. Lovely story, Lyn. My son is named after our first cat, Sam. Sam was a ginger like Tommy. He was "mothered" by our poodle Simone. When Simone died and Suna came into our lives, Sam mothered her as a pup. He even dragged little Suna around by the scruff of the neck like a kitten. Simone, Sam, Suna... we had an "S" thing going, didn't we? I named our next cat Nuptian. When she came into our lives, Sam was more of a grandparent than a mother-figure. Thank you, ladies for your kind and understanding comments! 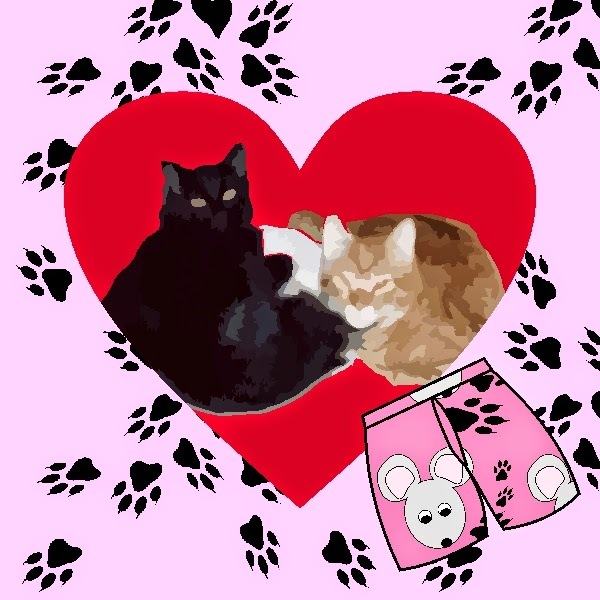 I'm in good company among all you wonderful cat and dog lovers!